VIENNA (Reuters) - The nuclear reactor that is believed to have supplied much of the plutonium for North Korea's nuclear weapons appears to have been shut down for the past three months, the U.N. atomic watchdog said on Monday, without suggesting why. The 5-megawatt reactor is part of North Korea's Yongbyon nuclear complex, the possible dismantling of which was a central issue in talks between U.S. President Donald Trump and North Korean leader Kim Jong Un in Vietnam last week. Some independent analysts, who are also using satellite imagery, believe the aging reactor is having technical problems. 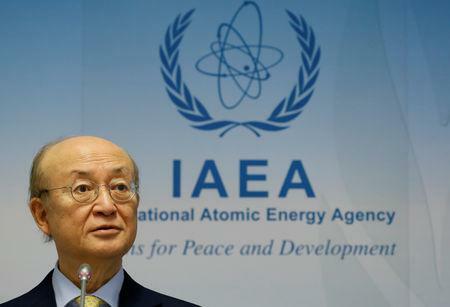 "The agency has not observed any indications of the operation of the 5MW(e) reactor since early December 2018," IAEA Director-General Yukiya Amano said in a closed-door speech to his agency's Board of Governors, which is meeting this week. At the radiochemical laboratory that separates plutonium from the reactor's spent fuel, there were no indications of such reprocessing activities, Amano added. "At the light water reactor, the agency saw indications of ongoing construction work. We also continued to observe indications of the ongoing use of the reported centrifuge enrichment facility," Amano said. 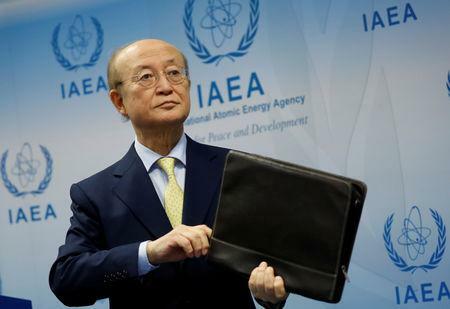 The IAEA has repeatedly said it is ready to play a verification role in North Korea once a political agreement is reached on the country's nuclear activities. The United States says it wants a full "denuclearization" of North Korea, but the Trump-Kim summit's abrupt ending without agreement left the future of their talks uncertain.